100 % SCANDINAVIAN NEW WOOL - With cream and mustard yellow color from the natural yarn of the Gotland sheep. It keeps you warm and cozy in the winter. In the summer can be used as a comfy picnic blanket. FITS EVERY ROOM AT HOME - The timeless striped design of diamond weave with tasseled fringe hem widths goes with every other furniture or decoration styles. FOR COUCH OR TWIN SIZE BED - The beautiful and inviting wool blanket makes any sofa or couch a retreat. The throws are big enough for twin size (75x39) beds as well. WASHABLE - We always recommend dry cleaning our wool blankets as stated on the label. However, these blankets are washable on a cool temperature using a delicate cycle with a specific wool detergent if preferred. The Gotland Collection is made from 100% Scandinavian new wool. This natural blanket is a must-have for you and your family. With generous dimensions, it is large enough to use on your twin size bed and also perfect for those cozy nights on the sofa. The Gotland has that lovely, comforting feel of traditional wool blankets. 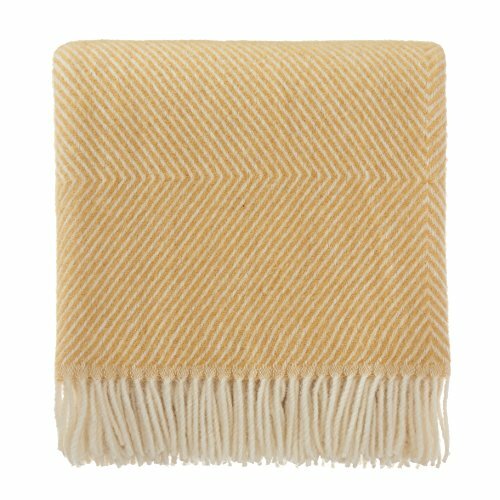 This throw is a classic which will last the test of time and keep you warm all year round. Care: We always recommend dry cleaning our wool blankets as stated on the label. However, it is possible to wash these blankets on a delicate cycle with a specific wool detergent if preferred. Designed in Denmark, made in Lithuania. Care: Do not machine wash or bleach. Do not tumble dry or iron. Professional dry cleaning, normal process.